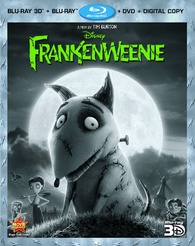 Walt Disney Studios Home Entertainment offers Tim Burton's 'Frankenweenie' in two Blu-ray options: a two-disc combo pack or a four-disc 3D package. For this review, the latter is being discussed. The first two discs are Region Free, BD50s sitting comfortably atop one another on the same panel. Only the 2D version comes with supplemental material. Opposite them, a DVD-9 copy of the movie hides beneath a Digital Copy disc. At startup, the disc commences with a series of 3D trailers for other Disney features, and then switches to a 3D animated menu screen of Sparky sleeping by his grave and music playing in the background. Tim Burton's latest gothic fairy tale dazzles and sparkles on 3D Blu-ray with a reference-quality MVC-encoded transfer. Presented in its original 1.85:1 aspect ratio, the film leans more towards a natural sense of depth rather than eye-popping stunts that'll make jump back. Granted, there are a couple gimmick shots that lunge at the screen, which are quite amusing, but there aren't many. The photography is on generating a convincing spatial environment in which the characters move independently of each other, and it works like a charm. Background information pierces deep into the screen with a great feel of distance and remarkable separation. Several scenes are beautifully layered for a terrific pop-up book effect which adds to the script's fairy tale quality. In spite of the dark glasses, contrast remains pitch-perfect, with brilliant whites, allowing for some extraordinary moments of visibility of the smallest background objects in the distance. The tiny little lines on the windmill and the lettering of the town's name on the hill are as clear as anything else in the foreground during those extreme wide shots. Black levels are inky rich and true with a penetrating intensity in the darkest portions without sacrificing any of the detailing. Gradations in the grayscale are spot-on and exceptional. From the blades of grass to the stitching and threading of baseball caps, details are razor-sharp. Ultra-fine lines on the face of Mr. Rzykruski, the science teacher, like the wrinkles around his eyes or just over his mouth, are very distinct and defined. Individual hairs, whether on the various animals or atop the heads of characters, are plainly perceptible and seem to move freely with the wind. Close-ups are particularly impressive as they expose minor blemishes made during each figurines making, giving them a great deal of texture and realism. The overall 3D image is a superb high-def transfer of a fun animated feature. 'Frankenweenie' comes to life on Blu-ray with a highly entertaining DTS-HD Master Audio soundtrack that surrounds and engages with a variety of classic horror cues. The most prominent effect is the sound of thunder and lightning, which cracks and booms with a deafening roar that spreads to all seven speakers evenly. During the less exciting scenes, such as during school hours, we can still hear a few atmospherics in the rears, creating a subtle but wonderfully engrossing soundfield. Danny Elfman's musical score does the majority of the work, consistently filling the background with its unique mix of circus-like merriment and understated gothic tones. Frankenweenie Touring Exhibit (HD, 5 min) — The exhibit which traveled the world showcasing the puppets, props and artwork used in the film.